Turin, Biblioteca Reale, inv. no. 15716/6. Black chalk and metalpoint (lead? ), 10.1 x 6 (from Bertini, 1958, below). PROVENANCE: Lugt 2724: acquired by Carlo Alberto of Savoy in 1845 from the dealer Giovanni Volpato. Black chalk, 12.5 x 9.4. Inscribed in black chalk at lower left: 7 and in brown ink: m.Angelo. PROVENANCE: Emigrant seizure; Louvre (Lugt 1886). Morel d’Arleux manuscript, 1793, 185, as Michelangelo. Berenson, 1961, no. 605, as Bronzino. Viatte, 1988, 33-34, nos. 27 and 28, as closely resembling the hand of Alessandro Allori. Sylvie Béguin, in Da Leonardo a Rembrandt. Disegni della Biblioteca Reale di Torino, edited by Gianni Carlo Sciolla, Turin, 1989, 70, no. 24, 71, Color plate, as by Rosso. Béguin, in Empoli and Volterra, 1996 (1994), 94, 217, Figs. 102-104, as by Rosso. 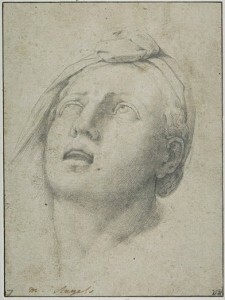 G. C. Sciolla, “‘Schizzi, macchie e pensieri:’ Le dessin dans les textes d’art de la Renaissance au Romantisme,” in A. Petrioli Tofani, S. Prosperi Valenti Rodinò, Le Dessin, formes, techniques, significations, Milan, 1991, p.26, Fig. 19. E.-G. Güse, in exh. cat. Zeichnungen aus der Toskana. Das Zeitalter Michelangelos, Saarland Museum Saarbrücken, 28 September – 23 November 1997, n. 78. 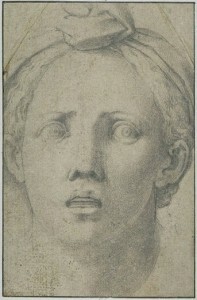 Pilliod, 2001, 243, n. 62, as by Bastiano del Gestra, one of Pontormo’s assistants. Cordellier, 2004, 101-105, Figs. 2, 5, 9, as by Cellini, and the head as male. Béguin first attributed the Turin drawing to Rosso in 1989 without any reference to the two related drawings in Paris, mentioning, however, that in 1958 Bertini catalogued the sheet as Florentine, first half of the sixteenth century, with an “accento più bronzinesco” than no. 475, another head in profile wearing an elaborately ornamented helmet. From the small illustration in Bertini’s volume, it is difficult to recognize, except that both show a head in profile with the mouth open, the conceptual or graphic similarity of these drawings. The suggestion of Bronzino for the head wearing a turban is more to the point and one that already had come up with Viatte’s recognition that the draughtsmanship of the two related drawings in Paris resembles the hand of Alessandro Allori, Bronzino’s most accomplished pupil. In 1994, as published in 1996, Béguin associated the two drawings in Paris with the drawing in Turin, recognizing all three as by Rosso Fiorentino. 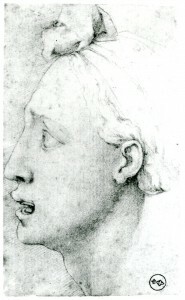 Sensing another lineage, Pilliod, in 2001, suggested Pontormo’s heretofore unknown assistant, Bastiano del Gestra, as the author of the three drawings. In 2004, Cordellier gave them to Cellini. Béguin thought the Turin drawing was the finest of the three images and it is with this head seen in profile that she aligned the evidence for the attribution to Rosso. Assuming that she knew the Turin drawing first hand at the time she recognized it as Rosso’s and then as related to the two drawings in the Louvre — although it is unlikely that she viewed all three together — the superiority of the Turin drawing may be something of an illusion. The three drawings show the same sculptured head and can be understood as exercises in rendering the same object correctly from three points of view. The Turin drawing may have been the least difficult to make, where foreshortening presented less of a challenge. In both Paris drawings the rendering of the nose and left ear is less successful than in the Turin sheet, where the profile, including the outline of the open mouth, makes a clearer and more memorable effect. But all three drawings need to be used in making the attribution to one artist. Cordellier’s argument for attributing the three drawings to Cellini is the most cogent of the several attributions that have been suggested, and the most compelling because of the extent of his carefully chosen comparisons. He does not account for the less successful drawings in Paris, although his comparisons may, especially the one with Cellini’s Juno, also in the Louvre. Here there is a similar degree of uncertainty in the rendering of the figure’s foreshortened left hand. Might it be that creating three dimensions of a figure on a flat surface was not an accomplished aspect of this draughtsman’s genius? Conceiving a figure in actual three dimensions was a sculptor’s primary talent. Hence the few surviving drawings by the sculptor Cellini, to which Cordellier suggests the addition of these three.